Alicia Holbrook was just trying to pass the time until her daughter went back to sleep with a TV show about alpaca farming. Five years later, her late-night idea has grown into Carolina Pride Pastures, a thriving alpaca farm boasting 20 alpacas and an educational field trip program. It was 2 a.m. and Alicia Holbrook’s 6-week-old daughter would not go back to sleep. She flipped on the TV to a show about alpaca farming. Her daughter soon went back to sleep, but Holbrook was hooked. The next morning, she called her parents to tell them she was going to start an alpaca farm in Pomaria. Holbrook says she “can come up with some harebrained ideas of things to do.” So she was surprised when her husband, Eric, thought the idea was a good way to use the 6 acres they already had bought from her great aunt. The male alpacas at Carolina Pride Pastures look on as Alicia Holbrook picks a blanket. So for two years, Holbrook and her husband researched alpacas, South American animals related to llamas and raised for their fiber. They bought 4 more acres, visited other farms, took a class at a Virginia farm and built a barn. Then, in 2013, they started Carolina Pride Pastures with five pregnant alpacas they bought for $5,000 from OnAgain OffAgain Farm in Spartanburg. Now there are 20 alpacas, one llama and one llampaca – a llama-alpaca cross. Holbrook has also teamed up with Lynette Lever, owner of neighboring Lever Farms, to add educational field trips that teach visitors about alpacas and farming. Holbrook also sells, online and at Columbia’s Soda City Market, the hats, scarves, mittens and custom orders her sister-in-law Laura Coy knits and crochets from the alpacas’ fiber. After alpaca fiber at Carolina Pride Pastures is processed and woven into merchandise by her sister-in-law, Alicia Holbrook and her husband sell the products at Columbia’s Soda City Market. “She does the dirty work and I do all the clean work, but it’s a partnership,” Coy said. And Hollbook’s mother has gotten over her initial shock. “She learned something different and brought something different into our life that is fascinating to watch,” Berley said. Holbrook said it was a difficult financial decision to leave her human resources career but that being there for her two daughters makes up for it. 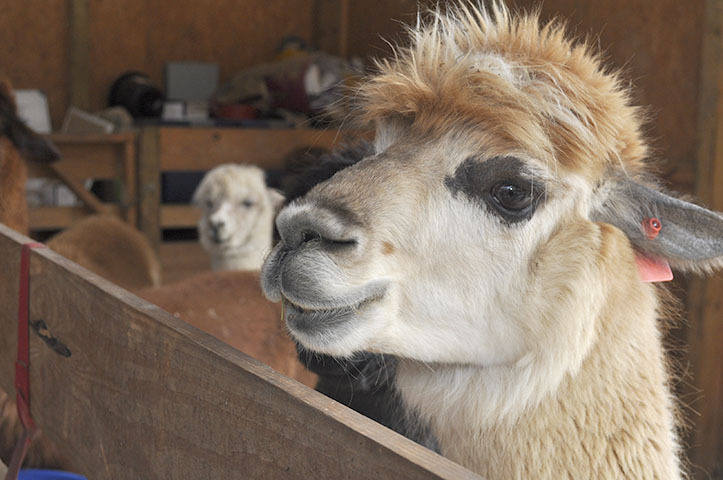 Columbia Voice sat down with Holbrook on the farm to learn more about the alpaca lifestyle. This excerpt has been edited for length and clarity. Listen to the entire podcast. So you found the alpaca farming TV show at two in the morning just to have something to do until your daughter went back to sleep, but why did you keep watching it until the end? The woman sold me on alpacas. I don’t know whether it was just the lack of sleep or what, but it just was really interesting … It was something other than a cow or a chicken or a pig, and the gentleness of the animals, the way they moved, the way they looked at her … they were communicating without using words. One of her 20 alpacas at Carolina Pride Pastures looks on as Alicia Holbrook cleans out the main barn. There were no other animals like alpacas in this area and you suggested you’d never handled alpacas or animals of that size before, so what was it about alpacas that made you so drawn to them? I think you said at one point that there’s an alpaca lifestyle; can you talk more about what the alpaca lifestyle is? You see a ton of folks, especially at our shows, that are at retirement age or had just retired and they … got into the business because they had horses or other livestock, and they realized that alpacas were easier keeps. … You could take them to shows where you met other alpaca farmers. A lot of them have, on Friday nights beforehand they have alpaca cocktail hours and social hours where the alpacas are in their pens and the other farmers are together networking, learning about what their farms do, some benefits they have, they have RVs and they go from show to show to show. So it’s a close-knit community? The main barn at Carolina Pride Pastures is divided into three stalls, and the back is open to the pastures. So after all the research and preparation, tell me what was going through your head when you first got those five alpacas from the farm. You said field trips are part of your business model; tell me how you came up with that and developed it with Lynette Lever. So when my oldest daughter was in preschool … they asked us if we could come out and visit the animals. … I said sure, so they came out and looked at the animals. It was sweet. The next week, they … paid $5 to go to the strawberry patch, and a lightbulb went off in my head: Wait, this is a way for us to have a financial stream, income stream coming in almost year-round. Before, by focusing on the fiber, really the only time that we had money coming in the door was October, November, December and a little bit of January. …So now my four months of making income has doubled. Check out pictures and posts from Alicia Holbrook on Carolina Pride Pastures’ Facebook page. Find out how to book a field trip to Carolina Pride Pastures. of the history of alpacas. You told me in a previous conversation that those field trips are your favorite part of this farm. Can you tell me why its your favorite part? It’s just showing the animals off and seeing the kids’ reaction. A lot of them, even the adults, have never seen an alpaca. … And so now them being able to just focus on the one animals that are there, and seeing the sheer difference now that we have llamas out in the pasture too, they are able to appreciate the differences. And two, for the children to really understand and grasp the idea that we can take a product from the animals … then we turn it into yarn, and we show them that yarn. And then that yarn is turned into a finished product. So, at one point, I will pull out raw fleece, yarn and a finished product, and the kids – the lightbulb finally goes off in their head that “wow, this is where our clothes can come from.” So it’s an educating experience that I hope that they take away from it. Alicia Holbrook loves having visitors at Carolina Pride Pastures. Click on the photo for a full gallery of pictures from Carolina Pride Pastures.